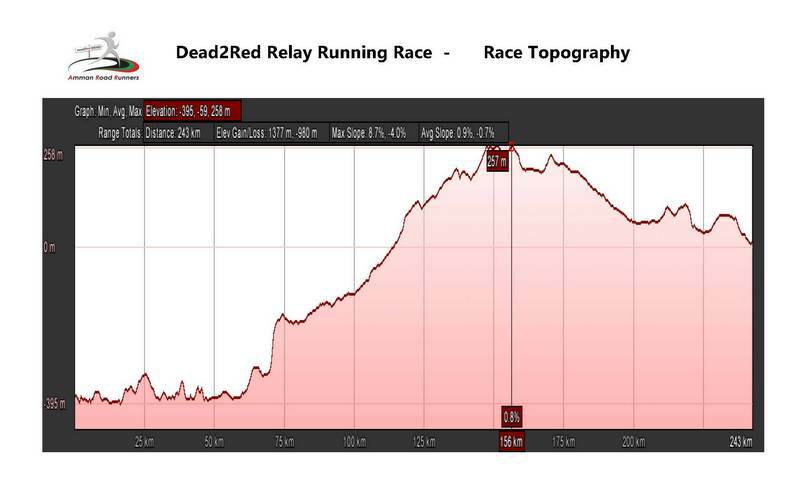 The Dead2Red Relay Running Race starts from the Mujib Bridge on the shores of the Dead Sea, and continues all the way up to the Gulf of Aqaba on the Red Sea, 242km away. Since the Dead Sea, the lowest point on earth, is around 415 meters below sea level, the entire race is a gradual ascent to sea level! The Dead2Red is a relay run, runners can participate in teams of 5 or 10 and each team must have a participant on the road at all times. Teams must complete the distance in 24 hours. This is a fun, challenging and exciting event. We rely on the honesty of each individual/team to participate within the rules of this event. The event is not restricted, and is open to all nationalities, ages, genders and fitness levels. The youngest participant each year is usually under the age of 10 and the eldest is over 60! From weekend runners to super athletes, from international corporations to local schools, the Dead2Red Relay Running Race unites people of all backgrounds and nationalities under one goal – to cross that finish line! Each participant must sign an individual waiver form. We will not accept more than one participant per form. Any participant under the age of 18 years must have the waiver signed by a legal guardian and accompanied by a photocopy of official identification of the legal guardian. You should submit the completed Waiver Form with your participation fees. You will not be officially registered if you do not submit your waiver form. Due to the nature of this type of event, we highly recommend that you/your team members have your doctors’ permission to participate. Adventure races, such as ours on open roadways have inherent hazards that you/your team members must be aware of and prepared for. It is highly recommended to you/your team members to also have current insurance which covers you and others in case of any personal accidents. If you decide against taking our advice, please be aware that the required signed Waiver absolves Amman Road Runners and Dead2Red Committee and all race officials from any and all damages, injuries and claims. This is a fun race based on the honor system. We depend on your honesty and integrity throughout the race and we expect you to try your very best to finish the race within the allowed time of 24 hours. The Dead2Red Committee does all that it can to prevent and deter cheating at this fun event. However, a limited number of marshals and the long distance of the race route, prevent us from fully monitoring all race participants at all times. Therefore, if you witness any cheating we suggest that you videotape the cheaters in action and submit it to the Committee immediately following the end of the race. The Committee will review any submitted video evidence and determine whether cheating has truly occurred. 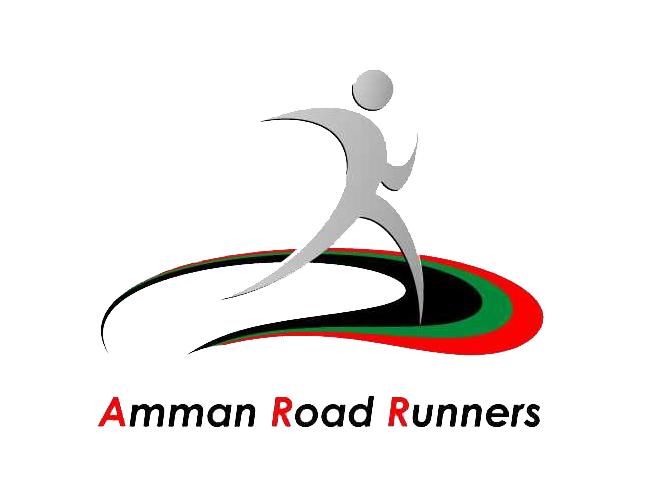 Any team caught cheating in any manner will be disqualified immediately and all team members will be banned from participating in all future Amman Road Runners events. Safety is our main concern during this challenging event and weather conditions are one of the factors that might affect the overall safety of our participants. As the date of the event approaches, the Committee will keep a close eye on the weather conditions along the race route. The Committee will then decide whether there is a need to postpone or cancel the event. In case of a canceled or postponed event due to inclement weather, please see the Refund Policy. The Dead2Red Relay Running Race will start at 4:00pm SHARP on Thursday afternoon for all categories except Schools. School teams will start at 4:15pm SHARP on Thursday afternoon. ALL TEAM MEMBERS must be present to start the race no later than 2:30 PM. If for any reason, no member of your team is present at the official starting time, you will be granted a 15-minute grace period in which to arrive at the starting point, proceed through final check in, and begin running. Otherwise, your team will be disqualified from the race. PLEASE NOTE: For all late starters, your official start time is the official starting time of the race. KINDLY REMEMBER THAT ALL TEAM MEMBERS ARE REQUIRED TO REPORT TO THE FINAL CHECK-IN TENT AT THE STARTING POINT. After the entire team has checked in, only one team member should stay at the starting point and the remaining team members and their vehicles should proceed to the second change over point which is located approximately 2 KM from the starting point. You have the option to change over at approximately 1 KM from the starting point BUT only one vehicle should stay at this point. We are providing you with a relay baton. This baton must be carried by the runner on the road running. When a new runner wants to start running he/she should receive the baton from the runner on the road. Any runner caught running without the baton in his/her hand causes his/her entire team to be disqualified immediately. Please note that a maximum of TWO support vehicles is allowed per team. The largest size vehicle allowed as a “Support Vehicle” is a Mini Van, 7 – 9 passengers. Any supporting vehicle larger than the Mini Van will not be allowed to participate. School Teams and teams registered in the Marathon or Semi-Marathon category are allowed to use a “Coaster Bus” or similar, with a maximum capacity of 15 – 25 passengers, as ONE of their support vehicles only. Any violation to these rules will cause the entire team to be disqualified. Accompanying/supporting Vehicles are not allowed to drive beside the runner at any time. The race route is via a major and highly used road and most of it does not have any lighting, so utmost driving measures should be observed at all times, day and night. Any vehicle caught driving beside the runner will cause the entire team to be disqualified immediately. On the other hand, we highly recommend that during the dark hours, your vehicle should drive behind the runner within a safe distance, to provide him/her with light. For safety reasons, runners are ONLY allowed to enter/exit the support vehicles from the RIGHT side of the vehicle (unless the runner is driving). No entries/exits from hatchbacks, the back of vans or pickups, or the left side of vehicles will be accepted. Any violation of these rules may cause the entire team to be disqualified. For most vehicles: One on the right side of the front windshield, one on the left side of the rear window, and one on the left rear side window. For Single Cabin Pickups: One on the right side of the front windshield, one on the left side of the rear window, and one on the tailgate. For Double Cabin Pickups: One on the right side of the front windshield, one on the left side of the rear window, and one on the left rear side window. If your team decides for whatever reason to withdraw from the race, please inform a marshal immediately. For safety purposes, our marshals take great care in monitoring the whereabouts of all teams. By informing them of your withdrawal you help prevent confusion and wasted time. Below are relevant documents pertaining to the Dead2Red Relay Running Race. Please be kind to the environment and consider using electronic versions of the documents where possible.